Heroes of the Storm is not Dota 2 or LoL. In fact, it’s hard to liken it to another MOBA as it brings differentiating factors to the table that make it unique. Sure, Heroes of the Storm borrows bits and pieces of the well-established MOBA genre like laning, leveling up your hero, the necessity of teamwork and character archetypes, but it also gives these features their own flair. Blizzard Entertainment is pretty good at making games. Over the years, the gaming community has seen Blizzard refine their games into the very essence of what makes them fun. Perhaps the best example of this is World of Warcraft, a MMORPG that started off with tons of potential and features that has been refined over and over again to give players new ways to play like faster leveling, easier quest systems and faster time-to-loot. With Heroes of the Storm it’s clear that Blizzard is trying to apply that same formula to the MOBA genre. Taking what is fun and exciting about a MOBA and splicing that formula into an approachable, yet compellingly deep game. Heroes of the Storm starts with a brief tutorial that is surprisingly helpful. MOBAs, much like fighting games, are hard to teach new players without hours of practice. That’s because there is a lot of theory and experimentation that goes into each character before the “best strategy” is figured out, and even then it’s not a guaranteed solution. Starting as Jim Raynor from StarCraft, players learn the ins and outs of HotS by having Uther the Lightbringer, a WoW character, walk you through the basics. There is some great dialogue between the two such as Raynor asking why he’s here in the first place and receiving a vague non-answer in return. Soon enough you’re off on your own and you’ll see relatively quickly that HotS is just like any other MOBA at the start. Teams of five are put together with the goal of destroying the enemy team’s core. Each team has five unique heroes, the players, along with helpful AI minions that span in one of the two or more lanes that the map features. Players jump into these lanes and destroy enemy minions to gain experience, level up, learn new abilities and eventually combat and, hopefully, beat the other team. This process continues until one team pushes the other team back enough to get in their base and destroy their core. That is an over-simplified way of explaining a MOBA but it’s good enough for those who haven’t played before. For those that have there are a few differences that players will notice with HotS in relation to other MOBAs. The biggest difference is how casual the game feels. This is due to multiple factors including team-based leveling, the exclusion of any character items, and the level-specific elements that turn the tide of battle quickly. In most MOBAs, leveling is a singular activity. Players gain levels by killing minions and learn new abilities this way. During fights with the other team’s heroes, more experience is gained by killing enemy heroes so one player can quickly level up and out-level the others should they be successful in this way. That’s not the case in HotS, leveling is a shared activity so when teams level up as one through a shared experience pool. This stops a single player from shining as a star of the team, a theme that seems to be a big part of HotS. For people looking to carry teams or shine on their own HotS may prove to be a disappointment. For me, I found the necessity of teamwork to be refreshing. It’s not just that teamwork helps win matches in HotS, it’s that it’s absolutely essential to victory as it’s designed right into the game. The one place where this forced teamwork feels like a downfall is in the battling. 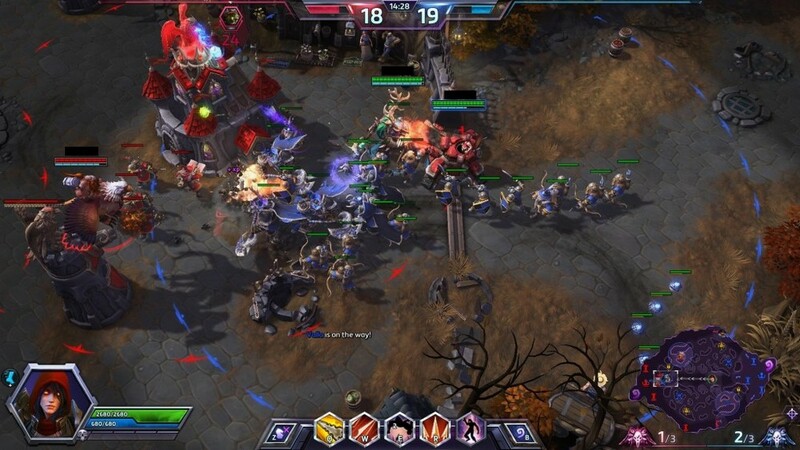 As mentioned before, team battles are essential in HotS but part of the reason why is you’ll have a very hard time battling three enemy players with just one character of your own. In games like Dota 2 or LoL there are skillful players who can wipe out three players, perhaps more, without help from their team. That’s tough to pull off in HotS, I haven’t seen it once actually, as characters just feel weaker on their own. In fact, 1v1 fights often feel unexciting as they become long, drawn-out waits for cooldowns to end or teammates to show up. Each of the seven maps in HotS have their own unique, level-specific features. You may need to control two shrines on opposite sides of the map to control a giant dragon-king on one map and then collect and cash in doubloons to have a pirate aid your cause on another. These level features are placed in strategic locations to make teams run into one another. You want that giant golem on your side or that curse to be laid on the opposing team so you do everything you can to meet the objective, which often means fighting the other team. These exciting moments of meeting the objective while battling the opposing team are some of the game’s best moments and they also stop the game from having the often-awkward standoffs where heroes are too afraid to battle one another for 20 minutes. As with most MOBAs, characters in HotS are split into categories. HotS has the standard MOBA archetypes of warrior, assassin, and support. Those also break down into melee and ranged variations to change things up a bit but they essentially mean tank, damage or healer/buffer. Where HotS makes it interesting is the inclusion of the “Specialist” class. This is Blizzard’s way of including a class-type that encompasses anything that doesn’t fit the mold. For instance, some specialists do massive damage to towers and buildings while others can summon creatures to aid them in battle, still others have interesting mechanics like spawning their own respawn point anywhere on the map. These heroes make the game interesting and provide loads of replayability in their strategies. It’s also worth noting that replaying the same hero levels up that hero outside of the game which unlocks additional abilities for in-game leveling. Unfortunately, most of the heroes are unavailable from the start and need to be unlocked with real cash or in-game gold earned through play. Cheap characters start at about 2,000 gold or $2.99 while high-end characters top out at around 10,000 gold or $9.99. Each week there are five characters that are unlocked as free-to-play for all players. This gives a new player a decent selection of at least the three main classes but it doesn’t guarantee you a specialist, at least from what I’ve seen. This is a shame because the specialists all play so differently and spending the money or hard-earned gold on a character you may not like is a rough proposition. Sure, Blizzard lets you try the character out in a single-lane game but that does little to tell you if the character is worth the money/gold. Speaking of money and gold, it’s worth noting the issues with Hero League—the game’s ranked system. Playing quick matches is a bit of a gamble as you pre-select your hero and get matched up with random players who have also pre-selected heroes. That means that you could have five tanks or no healers or no damage dealers, I’ve had all sorts of match ups and some just aren’t fun. Hero League prevents this by letting everyone pick and see their other teammate’s selections to form a more coherent team. Unfortunately there are roadblocks to unlocking Hero League which require you to be level 30 as a character, your profile levels up with you, as well as 10 characters that you have purchased with gold or cash, in-game characters don’t count. This makes it feel like a grind to build up this roster of characters, as the gold doesn’t come easily or quickly. The grind sensation in a MOBA is great when it’s in-game as it’s part of the game, but as a part of the business model it’s just not enjoyable. MOBAs are ever-evolving titles that grow and change over time. Blizzard games are often the same way and so a Blizzard-led MOBA has the chance to drastically change over the next few years. Hero League may open up to everyone, more characters may become free-to-play and items could be introduced though I would hope not as that’s a big draw for accessibility. Overall, Heroes of the Storm is a tearing experience. There is a lot that Blizzard did right here and a lot they did uniquely as well. Specialist characters are so refreshing and fun to play, the accessible nature just has Blizzard’s stamp of game development all over it and the maps feel varied and their objectives enjoyable. But at the same time the unfortunate business model of Hero League and the sense of the grind in this meta-game of collecting and leveling up heroes takes the fun out of the parts that are enjoyable. Perhaps with time Heroes of the Storm can age into something great, for now it’s worth checking out if you want to experience a different take on a popular genre. Trying to mix genres to create something new is something we’ve seen done dozens of times. The last game I remember taking the MOBA formula into a successful new area was Monday Night Combat, now called Super Monday Night Combat. The third-person action genre being mixed with the typically-top-down MOBA game world was an interesting mix. Archeblade feels fresh and interesting at first but it soon degrades into a crazy melee of characters jumping around and attacking as clunky animations prevent the game from really capturing what is so unique about it. Overall it’s hard to recommend a game that feels so lacking, both in terms of quantity and quality. The Bug Butcher takes an old, proven formula and brings it into the modern era. Many games have taken the Galaga style and slapped a fresh coat of paint on it, but The Bug Butcher does more than that. The game takes the formula we all know so well and adds a great look, some fun power-ups, and interesting enemies that keep the game fresh for its short duration. While The Bug Butcher won’t be amazing gamers with its unique premise anytime soon, it’s a game that is well worth playing for a handful of hours. There is a lot to dislike about Gemini: Heroes Reborn. The game performs shoddily at times and it’s generic and predictable in both its look and plot. Where the game shines is in experimentation and dumb ragdoll mechanics that will make you laugh as soldiers bounce around levels. It’s certainly not for everyone, but for those willing to look past the bumps and bruises, there is a decently fun time to be had with Gemini: Heroes Reborn. My time with Out of the Park Baseball 17 was like a trip to the ballpark, except when I shouted that the pitcher should be taken out, somebody listened, and that was a great feeling.